- The country will become rich, very rich. Given Lebanon’s traditional commitment to equalitarianism, the process will be run efficiently and the proceeds will be distributed equally among the Lebanese. - The Lebanese, who are generally known for their simple and non-materialistic lifestyle, will be tempted to abandon their traditional asceticism but they will do that with typical classiness and good taste. - Cooperation is a cornerstone of Lebanese society, and there are hardly any disagreements to be expected over the distribution and use of the oil wealth. The country’s democracy is also reinforced by informal network of inter-sect cooperation, which will ensure everything goes smoothly. - Parking valets will have their own valet parking service, which means that each restaurant/bar/nightclub will have a double valet parking system in front. - Several very exclusive mega night clubs will open in Beirut and other cities, each accommodating no more than 25000 people. 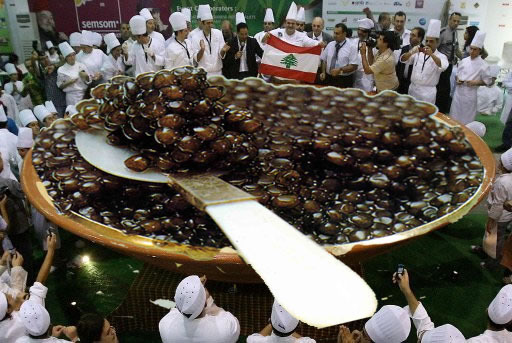 - The Lebanese will stop trying to produce The Largest Hummus Plate In The World. Instead, they will start making The Largest Caviar Plate In The World. And then celebrate the record by smoking The Largest Cigar In The World. - The average size of the gold crucifixes worn by Lebanese men will increase slightly by about 27 centimetres. - Plastic surgery will change from something you do once or twice in your life to a monthly event so you can keep up with the latest fashion in noses, cheekbones and elbows. - Electrical switches to alternate between the state and generator power supply will become available in gold-plated, platinum-plated, and diamond-studded designs. - Each Lebanese man will hire an assistant to carry his wallet, mobile phones, keys, cigarette pack and gold lighter, which they insist on holding in one hand now. - All Lebanese people will book Business Class tickets and then try to hustle their way to be upgraded to First Class. - Instead of ‘super’ and ‘regular’, petrol stations will have ‘baladi’ (local) and ‘franji’(imported) fuel. The fuels will also be branded based on traditional Lebanese themes, like Gebran Unleaded, Cedar and Cedar Plus for the racer in you. - Instead of burning tires in demonstrations, Lebanese protesters can now afford to burn entire cars. Which are drenched in oil beforehand because it’s free. - A state-of-the-art metro system will be built in Beirut, which no Lebanese person will ever use. - Lebanon will bribe its way to hosting the 2030 Football World Cup. The event is marred by clashes between Lebanese Germany fans and real German fans because the Germans felt the Lebanese went over the top in their support. Similar clashes occur between real Brazilian fans and Lebanese Brazil fans because of a particularly horrible samba-based dabke dance. - The government employees that work for two or three days a week will stop bothering to show up altogether, leading to a 230% increase in productivity. - Because Lebanon is so rich and France is not doing so well, Lebanon will buy the French language from France and change all the rules to Lebanese pronunciation and grammar. When challenged about their mangled French, the Lebanese can say ‘but it’s our language’. - The roads will still be full of potholes, but they will be covered up with exquisite handmade Persian carpets. - The Lebanese will build a very large gold statue of an intertwined cross and crescent to symbolise national unity. Then disagree bitterly over where it should be placed. - And finally, the average citizen will be so rich that they will afford to have a coffee once a year in downtown Beirut. Warning: As with every computer model, the results might not be 100% accurate. Maybe on the day that Lebanon achieves energy independence, Hassan Nasrallah will be willing to do a belly dance with seven veils as a sign of celebration. That would certainly draw world attention. Awesome blog, please write more!